Style your hair while you regrow it. Gives you hair fullness, control, and stiffness. Dries quickly. Non-oily. 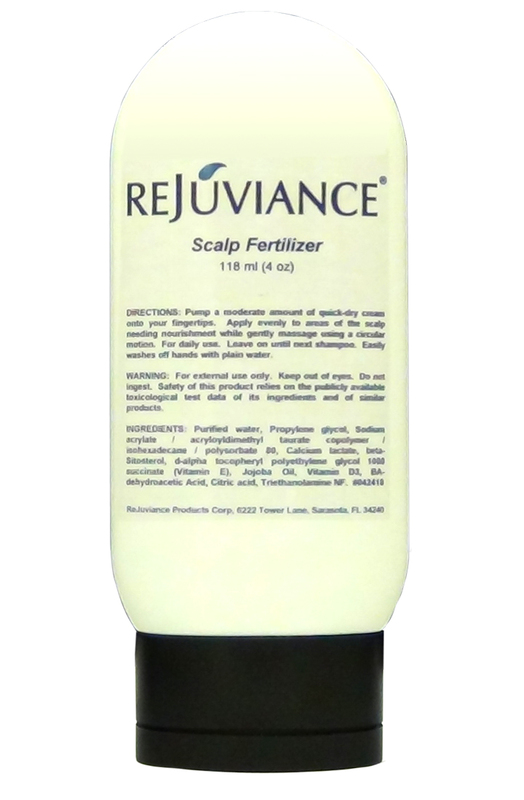 Scalp Fertilizer uses ReJuviance transdermal technology to deliver lactate stimulant across the scalp directly to balding hair follicles that need it. Recent research at the University of California Los Angeles discovered that increasing lactate production genetically in research mice affected their hair follicle stem cells which favorably affected hair growth. Delivering calcium lactate directly to your follicle stem cells provides the "scalp fertilizer" needed. The calcium lactate also surrounds existing hair strands, thickening them until the next shampoo, providing major "bulk" to your existing hair. This product also contains the DHT-blocker Beta-Sitosterol, Vitamin D3, and Vitamin E, all of which are needed by your follicles for normal hair growth. Topical application. Squeeze thick lotion onto fingers and apply evenly to thinning areas of the scalp and to existing hair while gently massaging in using a circular motion. For daily use. Easily washes off hands with plain water. May add additional layers and leave on until next shampoo. INGREDIENTS: Purified water, Propylene glycol, Sodium acrylate / acryloyldimethyl taurate copolymer / isohexadecane / polysorbate 80, Calcium lactate, beta-Sitosterol, d-alpha tocopheryl polyethylene glycol 1000 succinate (Vitamin E), Jojoba Oil, Vitamin D3, BA-dehydroacetic Acid, Citric acid, Triethanolamine NF.